A simple flight from Orlando to Atlanta, stormy weather results in a horrendous take off and massive turbulence. Everything seems OK when they get to smooth sails but a mechanical failure causes the plane to drop out of the sky. Within the first 20 minutes we get the insane view of the plane flying upside down, the panicked co-pilot and flight attendants, as well as bodies tossed around when people don't listen to the fasten seatbelt sign and a brace order. Elsewhere Nicole (Kelly Reilly) drug addict decides she wants to end her life by overdosing. Flight is clearly about more than this epic plane crash. 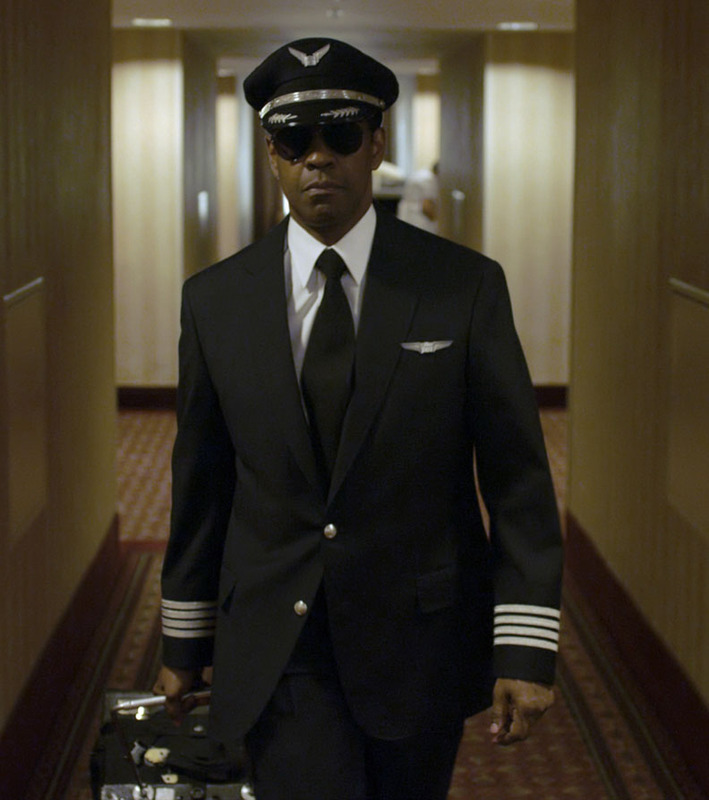 Denzel Washington stars as Whip Whitman the pilot of this commercial flight. After the impact he wakes up in the hospital and this is when the movie becomes less about this insane plane crash and more about the downward spiral of an alcoholic. Denzel really goes all in here. The movie opens with Whip in a hotel with his girlfriend and co-worker Katerina (Nadine Velazquez) where he drinks beer, snorts coke and then proceeds to fly a plane. Does this man look high as a kite and drunk? While he first decides to quit drinking on his own after being released, he isn't capable of it. We see him bargaining, fall out drunk, fighting... he runs the gambit in this film. If Denzel doesn't get the Oscar nom here I'd be surprised. Whip is so flawed and unapologetic about it that its spot on. While those around him want him to quit he's not there yet and the movie becomes more about how it rips at the people in his life. Every attempt at sobriety on his own fails. He's not ready to quit until he's backed in a corner but his longtime friend and Union Rep Charlie (Bruce Greenwood) and has to stay sober before his big hearing about the plane crash. 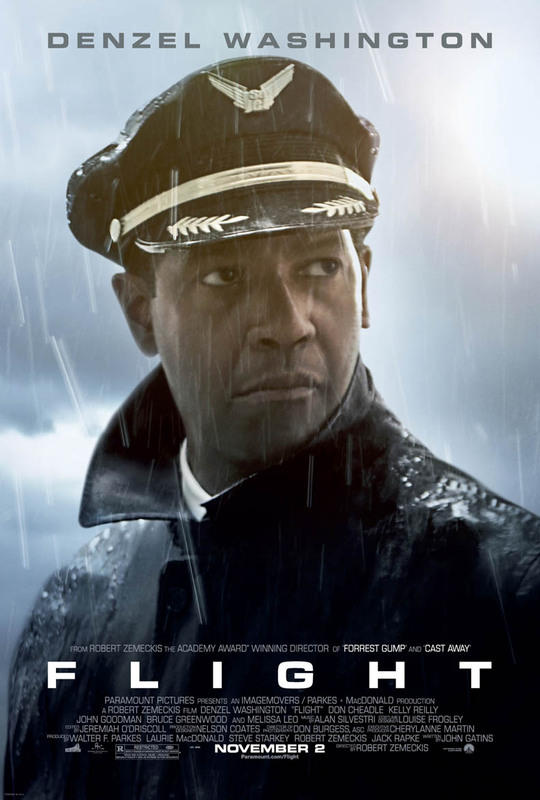 While the plane crash pulls you in this movie is definitely a trigger for families who have had to deal with alcoholism and drug addiction. Thats really my only word of caution since the subject matter might hit home really hard. The people around him all know he's an alcoholic. He's the only one in denial and we see it through that lense. The movie also stars John Goodman as Whip's best friend Harling. He's a hippie drug dealer and steals his scenes. Don Cheadle also stars as the attorney hired by the union to represent Whip. He's the only person who doesn't personally know Whip who fights with him as he learns more and more about how much of a problem he has. Robert Zemeckis directs his first live action movie in over ten years. I give this movie a Full Price. There's just so much about this movie I loved. The characters, the intensely flawed, bottom of the barrel scraping Whip and that there is no Hollywood glamorized story in here. When Whip's new girlfriend Nicole ties to sober him up as she kicks heroin she fails. Even though he's a hero his ex wife and son still hate him. It did get a little preachy there in the middle where everyone started saying everything that has happened from the plane crash to Whip's life was because of god but in the end no neat happy ending. They could have played this 2 ways and I would have been happy with either.